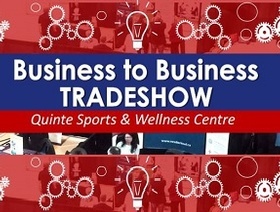 Last Thursday, Oct. 20th, our team had a blast at the Bay of Quinte Regional B2B Trade Show held at the Quinte Sports & Wellness Centre. We had many great conversations regarding dentistry and oral health, and even had the pleasure of meeting several local business owners (whom we would love to invite to visit us anytime)! We'd also like to congratulate our very own Courtney, who won a wonderful Godiva Chocolate basket at the event; compliments of Costco Kingston. (We're definitely a little jealous… I mean, who doesn't love gourmet chocolate)? Our team is definitely looking forward to attending more trade shows in the future!